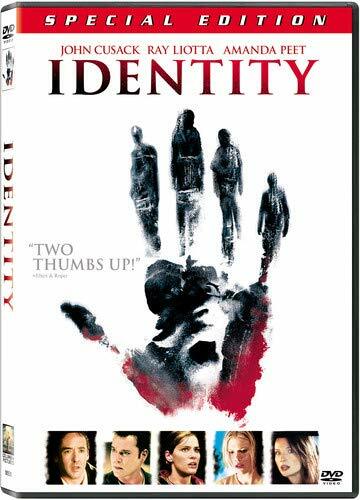 Identity is a tightly constructed film in the noir genre that plays with the theme of multiple personality. Mangold has previously directed Kate and Leopold; Girl, Interrupted; and Copland, and he gets some excellent performances from John Cusack, Ray Liotta, Amanda Peet, and Clea Duvall. As Cusack says in the "making of" documentary included with the DVD, the film is a sophisticated adult thriller, and you don't see too many of those. After watching it several times, the initially confusing mix of ideas transforms into a coherent narrative. The main story is set at a motel in the middle of the desert, during the middle of the night, in the middle of an endless downpour. Different characters are thrown together, each with a secret. Soon, one by one, they start to suffer violent deaths. But there is another concurrent plot, a midnight judicial hearing in which the representatives of a man condemned to be executed the following day make one final argument for an insanity defense. A lawyer and psychologist argue that their client has dissociative identity disorder and he did not understand what he was doing when he committed multiple murders for which he was sentenced to death. It takes most of the film before we comes to understand the connection between the two plots. Until we see the connection, it looks as if the murder mystery has supernatural elements. When the connection becomes clear, they mystery deepens. It transpires that the events in the motel are going on in the mind of the killer, but, far from this making the motel mystery irrelevant, it becomes all the more crucial to discover which of the personalities is killing off the other ones. While there is much to admire in the artistry and craft that went into the making of this film, its use of the theme of multiple personality is exploitative and unsatisfying. It relies essentially on clichéd and derogatory images of the dangerous mentally ill. It takes highly distorted caricatures of multiple personality solely for the purpose of a plot device. This undermines the integrity of the story, and the ending even resorts to a cheap horror tactic. Ultimately, the film is a disappointment; the complexity of the story and the quality of the acting are dragged down by this objectionable portrayal of insanity. Mangold's commentary shows how much thought he puts in his direction, but it also betrays the lack of understanding of multiple personality shown in the film.